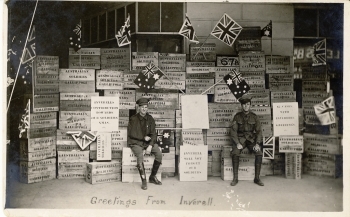 During October 1915, a consignment of 67 cases of gifts for our soldiers at Gallipoli were packed by staff at A.M. Cansdell and Company's Inverell store. These items were generously donated by district residents. Organising this quantity of donations and packing was time consuming. 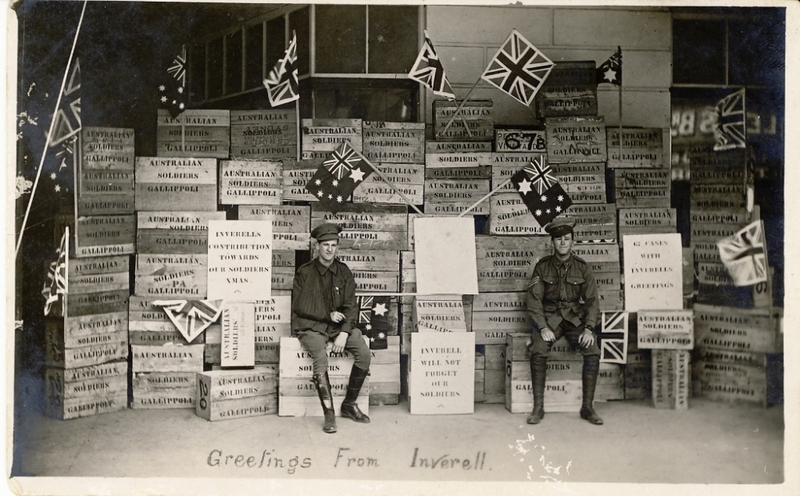 Each tin and package was individually labelled with the sender's name and each case was inscribed with the words Australian Soldiers, Gallipoli. The cases contained items such as preserved fruit, jam, condensed milk, coffee, cocoa, tomato sauce, cakes, tobacco, cigarettes, plum puddings, biscuits, lollies, rolled oats, rice, tinned meats, salmon, honey, tomato soup, tooth powder, towels, soap, writing pads and playing cards, all of which were much appreciated by our soldiers. Cansdell's displayed the goods at the front of their store, prior to arranging their transport to the railway for shipment overseas. This was just one of the many appeals supported by this store and our community at home during the War. If you are able to identify the two soldiers in this photo please contact us.